OCEANFRONT Property, beautiful views overlooking the beach. HUGE PRIVATE DECK! Ocean front rental only steps from the beach. Property located on the beach boardwalk. 2 bedrooms, 1 bathroom, with a large living room area. Sleeps 4, up to 6 people with air mattress. Washer and dryer included. Spacious deck with an amazing view of the ocean and boardwalk below. Includes deck furniture and BBQ. Also includes beach towels and chairs to take down to the beach. Restaurants, shopping and other amenities close by. PARKING SPOT NOT INCLUDED, may be able to purchase for an additional fee. PLEASE CHECK OUT OUR DOWNSTAIRS UNIT! SLEEPS 10 PEOPLE! 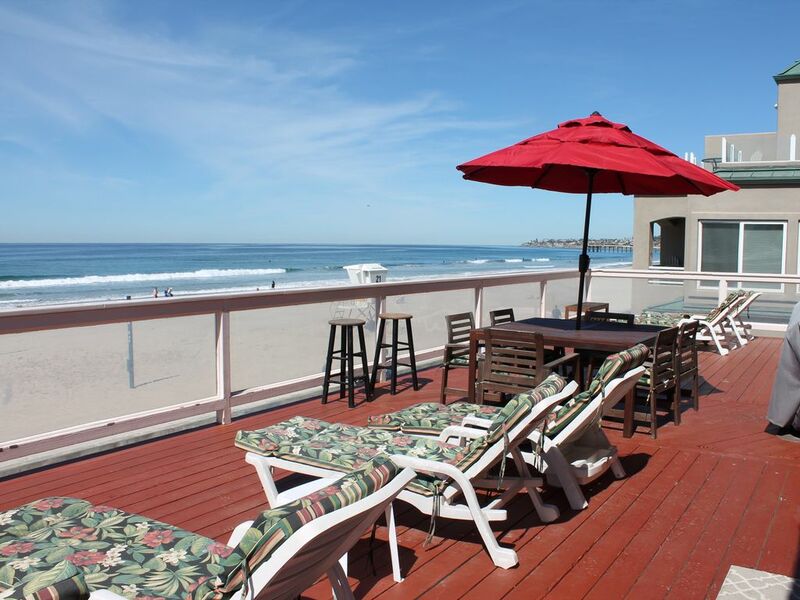 We've heard our renters describe the deck as "the best in Mission Beach! You can't beat the view! " Patio seating also available for 6. Queen-sized air mattress available. Parking MAY be available for an extra fee upon request. We were celebrating our 50th wedding anniversary and it was just perfect for us. We had fun entertaining family on the deck. Excellent location. Clean. Excellent host. Enjoyed our weekend, never had to leave the house! We rented both the upstairs and downstairs units for our family reunion. It was fantastic! Being right on the boardwalk/beach is hard to beat! We planned our day so we would be on the balcony to watch the sunset! Breathtaking! Mindi was amazing and super responsive if there was any questions/issues. Will definitely stay here again! Perfect place for a family reunion! We rented both the upstairs and downstairs place to accommodate our family of 16’s Christmas celebration. The upstairs deck is the best on Mission Beach! The sunset views every night were magical. Plenty of beach towels and beach gear to use. The home has nothing fancy in regards to kitchen upgrades but it was a great place for families with lots of kiddos. We hope to be back in the future!! ***HOLIDAYS SUBJECT TO PRICE INCREASE. Any parties larger than 6 will pay an extra $10 per day/per person. Payment to be made via check and or Paypal depending on how close we are to the rental stay. $125 cleaning fee per stay (not per night). $300 refundable deposit required. Refundable as long as contract terms are met. Parking in the garage for one car MAY be available upon request for an extra fee.